mammals | Great Auk - or Greatest Auk? As the boat rocked gently on the vast, prolific, pulsating ocean, I lay in my bunk and tried to do some reading. I’d brought along Seven Tenths by James Hamilton-Paterson, a lyrical (though sometimes a tiny bit precious) elegy for the abused and demystified oceans of the world. I couldn’t help but think of the whales. I knew, of course, intellectually, that whales are big, and so is the ocean. But actually experiencing the difference in scale between these creatures, this environment, and my puny little self…. Consider. Some whales can live to be 200 years old, maybe older, we don’t know. They have complex social structures. 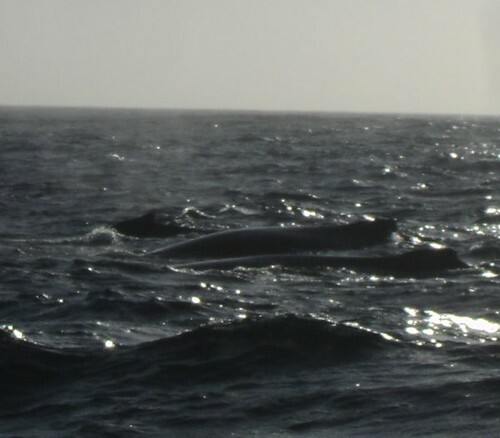 And at their respective nadirs, there were only an estimated 5,000 Humpbacks and less than 2,000 Blue Whales in the world. So some of those whales we met, might very well have had friends and relatives killed by humans. Yes, this is shameless anthropomorphism. But in the case of these long-lived cetaceans, as with other highly social animals, it hardly seems out of place to think that they could have such bonds in their own right, not just as a way of being honorary humans. Certainly, they can learn. Certainly, they can remember. Yet very few whales have ever offered violence to humans even when they could have got clean away with it. And they could have. The other thing that struck me as I lay in my bunk was how very not-solid the water was, how things could sink in it, how very much irreversible it was if one were to lose a book or a pair of glasses or an Inimitable Todd or a self overboard in a moment of carelessness. Or even a boat if it were to sink. The Pacific Ocean, for those of you who have not seen it, is a whole lot of water. The rocking of the boat did not change. It was still gentle, still steady. It was just, suddenly, less soothing. After a pleasant night of sleep (I don’t think all the other birders enjoyed it as much as I did) we woke up heading for the Channel Islands. At first, the birdlife was very similar to the first day’s, with fewer but still present Brown Pelicans, another Skua, several Pomarine Jaegers and numerous shearwaters, including our first Buller’s (lifer). Buller’s Shearwater is one of those interesting species that doesn’t align well with our land-based sense of what makes a bird rare or not-rare; they’re abundant, but far out at sea so that most people rarely lay eyes on them. 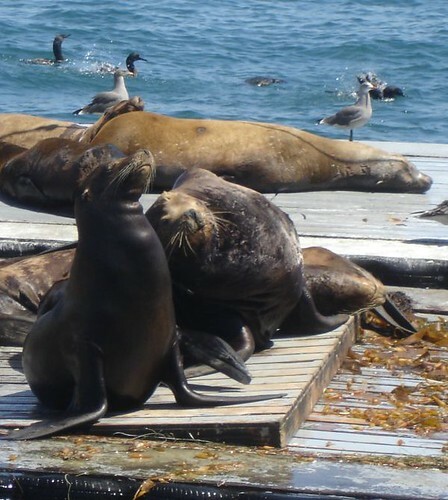 And although they range over the whole Pacific, their breeding colonies are clustered tightly enough that a rapid-fire series of relatively local disasters could do the whole population serious harm. So they’re considered a vulnerable species, even as we saw over 200 on our trip. As we bore towards the southernmost island we were briefly accompanied by a pod of Risso’s Dolphins and spotted a Northern Fur Seal doing that weird Fur Seal thing where they stick their flippers out of the water in a loop and point them skywards to thermoregulate – I initially mistook it for a floating tire. Also numerous as we neared the islands were phalaropes; mostly Red-necked, a species that I had the good fortune to see at Jamaica Bay a couple years back, but also a small group of Red. Red was the last species I needed to complete the phalarope trifecta! Phalaropes are my second-favorite group of birds, so that was a big moment for me. Shortly thereafter yet another lifer hove into view in the slim dark form of an aptly-named Pelagic Cormorant. Another Sabine’s Gull was in the mix, along with the trip’s first Common Tern. Dozens of phalaropes were taking off and landing everywhere we looked. I saw a non-breeding-plumaged Pigeon Guillemot briefly, but much to my frustration it disappeared underwater before anyone else got anything but a brief and unconvincing look at it. This frustration only got worse when I spotted a Northern Fulmar, only to keep quiet in self-doubt (“maybe just a gull with weird light reflecting off the water onto the bill”) and have someone else call it a moment later. With the constant wind, engine noise, waves, and my throat dry no matter how hard I tried to stay hydrated, I wasn’t sure that I could effectively call a bird even if I had no mental blocks! It was all very well and good to tell myself I didn’t care what anyone thought of me, but I didn’t want to be one of those listers who goes on a trip and just looks at birds that other people point out! I had no qualms about who pointed that one out. I just ran forward and found myself with an excellent, extended look at yet another awesome alcid. We would see more Murres as the afternoon flowed on, but none as cooperative and close as this one. 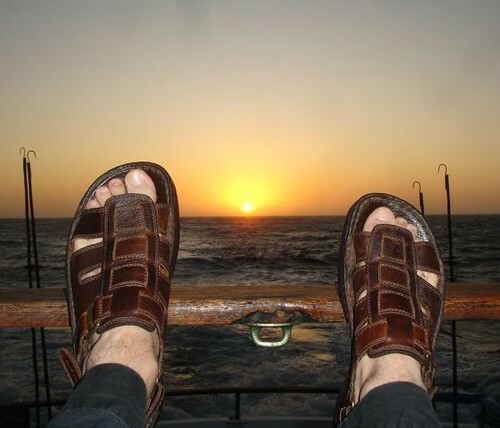 At San Miguel Island, the leaders decided to take us west, to test the tenor of the sea and decide whether we should spent the night at anchor or head out further. Unsheltered by the islands, things immediately grew choppier and only a few hardy souls rode the bow, let alone the upper deck. 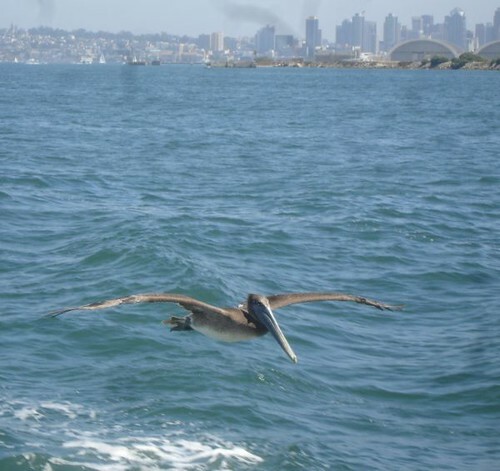 In the stern, someone cried out “Albatross!” and everyone leaped up. Trapped behind tall people, I strained to see the bird before it crossed the horizon to no avail. My funk returned, as well you might imagine. But not for long. One of those hardy souls on the upper deck spotted a whale spouting in the distance. It looked like a Humpback. We headed in the spout’s direction. Soon there were more spouts. And then more. 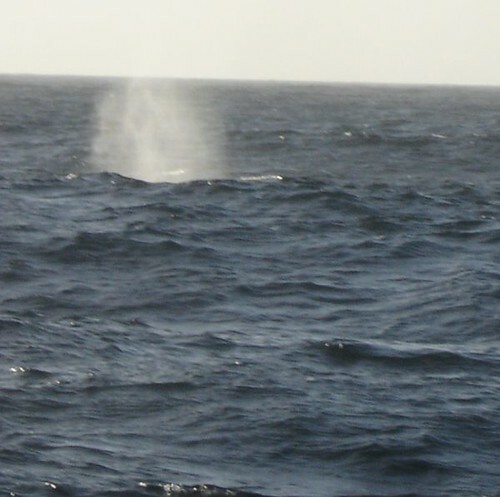 And over the next hour or so, we watched some twenty-five Humpbacks and five Blue Whales surrounding the boat, blowing, flipping their flukes, and going about their business with their remarkable grace. 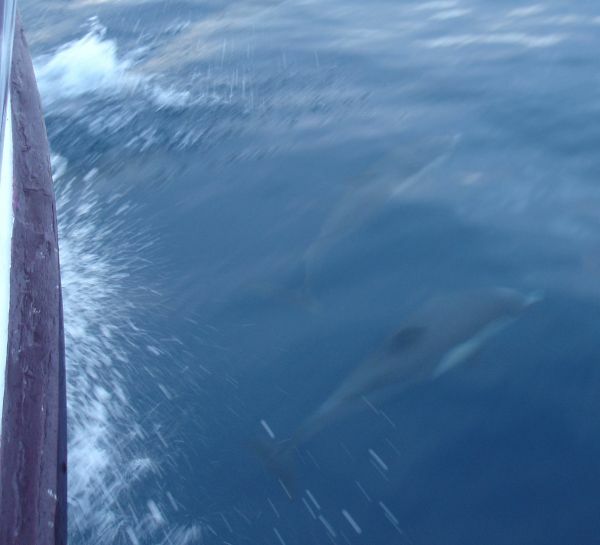 They were so close to the boat that we could hear the tonal difference in breathing between the species, so active that no one could hope to see everything, and so immense that I was suddenly struck by the almost comic smallness of our boat on the ocean. 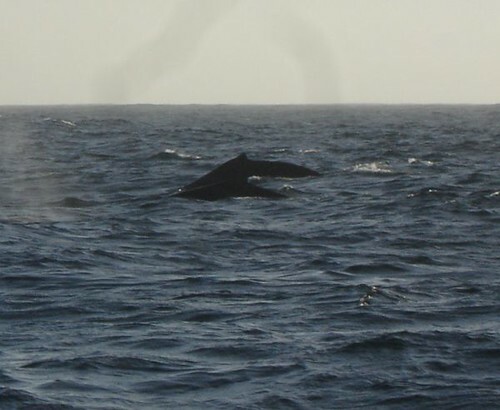 This was my first encounter with Humpbacks, as yesterday had been my first encounter with Blue Whales, but even the experienced whale-watchers on board said that it was one of the largest pods they’d ever seen. I found myself just turning in circles, trying to take it all in. 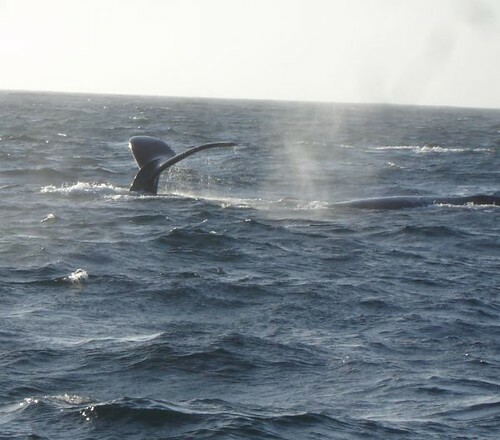 Eventually the whales moved on, and we headed back for the shelter of the islands to anchor for the night. And as we did so, the albatross, or another very like it, returned. This time it stayed with the boat, and so I watched my life Black-footed Albatross until the earth rotated the sun out of sight, feeling entirely content. And there were yet two more days to come. How could they hope to top this? Bright and chipper at the crack of noon*, the Inimitable Todd and I lined up with the other twenty-odd birders and their multitudes of luggage, ready to board the Searcher. Was I excited? Just a little. This boat would be our home, our vehicle, our observation deck, our veritable Xanadu of Birding Bliss for the coming adventure. And right now, it needed to have a pump replaced. So we hung out on shore for a bit, making small talk and getting to know each other. Then got on board, got a safety lecture, got our stuff stowed. Got out our binoculars and got ourselves positioned at the stern as the boat at last – at last! – began to make its way out of the harbor. 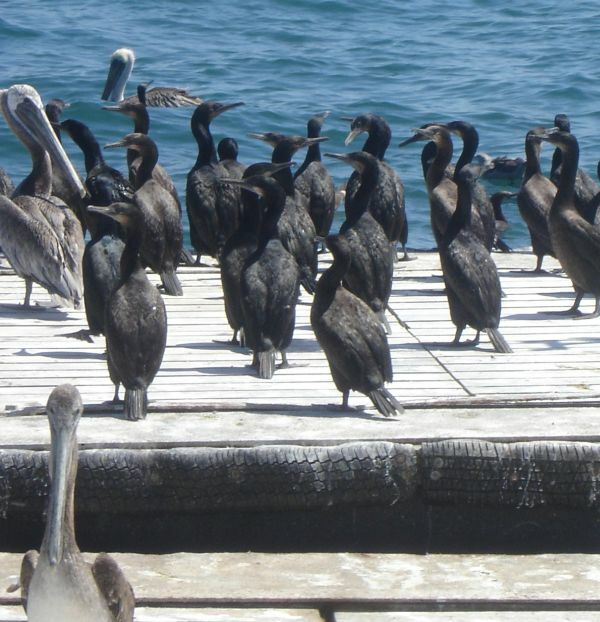 My first lifer came before we even reached open water; a floating platform (apparently the top of some kind of storage locker for bait) was virtually covered with Brandt’s Cormorants, along with a few Brown Pelicans and some California Sea Lions, not to mention Western Gulls and the truly fabulous Heerman’s Gulls. Abundance would continue to be the theme of this first day (in notable contrast to my last pelagic experience). We were joined by the shearwaters not far out; mostly Sooties and Pink-footed (the latter another lifer) but including a handfull of Black-vented Shearwaters (another lifer.) Again in contrast to the lone Atlantic Sooty I saw last year, many of these birds elected to follow the boat for some distance and show off the wave-skimming skills that give the group its name. There were gulls as well, including a single Sabine (lifer). Less than a mile out, we had our first jaeger. In fact, before the day was out we’d have multiple sightings of all three jaeger species – Pomarine, Parasitic, and Long-tailed (lifer, lifer, and lifer) – many far longer and closer than the desperate foggy glimpses that I’d been led to believe were typical looks. And then there was the moment when a loud cry of “Skua! Skua! Skua!” went up from the leaders around the boat, and a South Polar Skua** (a bit ratty in molt, but another lifer) came down directly across the bow and circled us long enough for all aboard to get an eyeful. 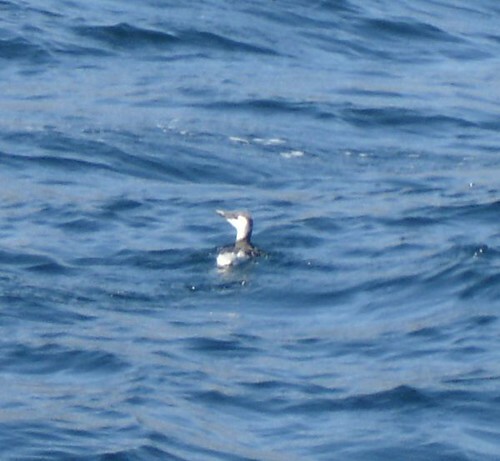 Less accommodating but even more exciting was the Craveri’s Murrelet that we spotted at the north end of the Nine-Mile Bank (apparently a standard stop for San Diego pelagics). It didn’t stick around long, but out of tribal affinity – or perhaps the desire for a taste of blog fame – it popped up directly underneath the bit of rail where I was standing before disappearing forever as only a softball-sized bird in a Pacific-sized ocean can do. Needless to say, lifer. Various storm-petrels also abounded in this area; I added Black and Least to my life list but missed the Leach’s that some others spotted. To cap it all the food was good, the company congenial, the weather pleasant, and the tummy untroubled by turbulence despite my lack of pill, patch, or other preparations. As I fitted myself into the confines of my bunk, I could not help but feel that things were going, as it were, swimmingly. What would the next day hold? Stay tuned! 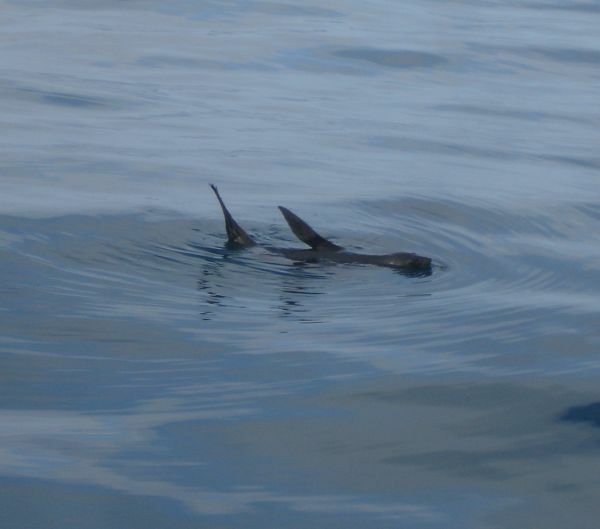 *there are many nice things about a multi-day pelagic. One is that you don’t have to leave at the unmentionables of dawn to get out to where the birds are. **I privately curse the humorless or perhaps teetotalling bird-namer who missed the opportunity to name this bird the Jaegermeister. Here’s a special bonus two-trip entry, because my week has been insanely busy. On Thursday, I went out to Prospect Park to clear my head before immersing myself in the kitchen. Initial disappointments, including a distinct lack of Pine Siskins at the Breeze Hill feeders and a falcon that flew overhead too rapidly to be positively id’d (based on size I suspect it may have been a Peregrine but can’t rule out a large female Merlin,) were swept away when I saw my life Red-necked Grebe on Prospect Lake. These grebes are rare but regular in the park and two individuals were seen this past spring, but I’m a little disappointed that no one else has reported this one. Nevertheless, it was a distinctive bird, with the silhouette, size, dark cap, and traces of red remaining in the plumage of the neck making for an id that I’m confident in. I also had a good mammal sighting in a melanistic squirrel. Then I got back home to find that the stray cat we took in last month was delivering her kittens in the bathroom! Dinner, let alone posting my bird list, was necessarily somewhat delayed. Friday I stuck close to home, but this morning I went to Central Park with Todd. While he trained for the marathon, I did a little walking through the Ramble and the Shakespeare Garden. I didn’t get a long list, but I did pick up Rusty Blackbird which I was afraid by this time I might have missed for the year.